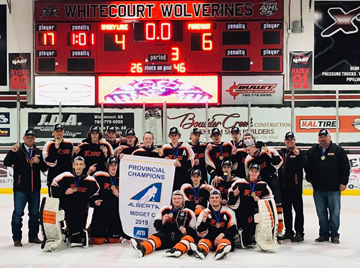 The Bow Island/Foremost Flyers midget ‘C’ hockey team had a story book ending to what was an incredible season by winning the provincial banner and gold medal in Whitecourt this past weekend. The black and orange did not need much motivation to get up for the excitement of the provincial tournament as they won the league pennant the weekend prior and took their consistent work ethic with them that carried them this far into the season. “I was really proud of the boys,” said head coach Clark Hughson. The Flyers’ played five games in a span of four days en route to victory and played all unfamiliar opponents. However, the style of play never changed despite some line-up shuffling with two players sitting out in two separate games. “We had to change things up, but the style of play never changed,” said Hughson. The Whitecourt arena’s bleachers were crowded with Flyers apparel as well as the final being viewed at the Foremost bar on Sunday, which had the players energized to put on a show for their supporters. “The support we got from both the communities all year long was unbelievable,” said Hughson. The team won their opening game against Zone 7’s Three C’s 6-1 on March 21, they doubled up High Level 6-3 on March 22, before losing their final round robin game 7-1 to Westlock. With the loss, that placed the Flyers second in their pool and a semi final date with first place Brooks from the other pool and edged them 3-2 on March 24 before bringing home gold with a 6-4 win over Smokey lake in the final.